36.75% of all building materials were manufactured within 500 miles of the building site. On March 18 2010, the Harvard Center Shanghai officially opened, marking a new era of engagement between Harvard University and Asia. The center, which occupies an entire floor of one of the newly constructed skyscrapers in the city’s Pudong section, is the first such presentation and research space of its kind outside of Boston and Cambridge. The center is intended to serve as a hub of research and teaching activity, and while its creation has been spearheaded by the Harvard Business School (HBS) and the Harvard China Fund, it is specifically intended as a resource for Harvard faculty, students, and alumni across all of Harvard’s Schools. 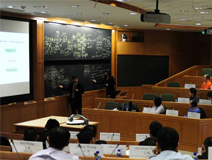 The Harvard Center Shanghai will operate under the direction of the HBS Global Initiative.